Once the blade has been designed for optimum operation at a specific design tip speed ratio (defined as the ratio between the blade tip speed and the wind speed), the performance of the rotor over all expected tip speed ratios needs to be determined. For each tip speed ratio, the aerodynamic conditions at each blade section need to be determined. From these, the performance of the total rotor can be determined. 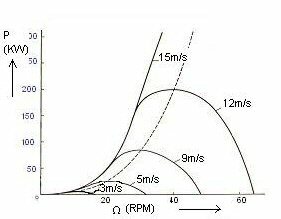 The results are usually presented as a graph of power coefficient CP (defined as the ratio between the rotor power and the dynamic power in the wind) versus the tip speed ratio λ . 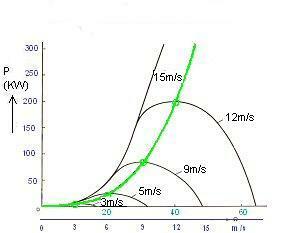 This graph is called the CP-λ curve. - At very high λ (here at λ=12) the rotor runs so fast that it seen by the wind as a completely blocked disc. The wind flows around this "solid" disc (as if it was a solid building), so there is no mass transport (wind) through the rotor, and hence no possiblity to extract energy from a moving mass (the wind). - Somewhere between λ=0 and λ=12 there will be an optimum value (here at λ=8) for which the maximum power is extracted. This will be the condition in which the (average) velocity at the rotor disc is 2/3th of the wind speed according to Betz law. The CP-λ curves are used in wind turbine design to determine the rotor power for any combination of wind and rotor speed. 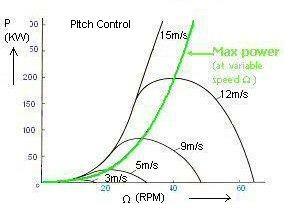 Below, the power curves for variable speed and fixed speed machines are derived from CP-λ curves. For more information on the concepts of variable-fixed rotational speed and pitch-stall control, please refer to pages Rotational speed and Power control. 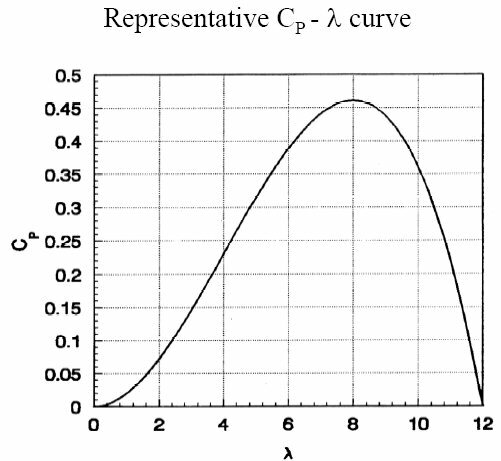 The starting point is the optimal CP-λ curve of the rotor. 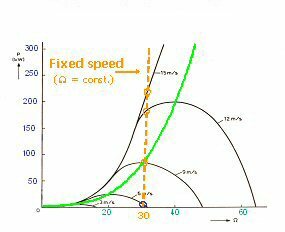 If this CP-λ curve is made dimensional again it results into "Power vs rotational speed" curves, as shown in the graph on the right. For maximum performance the rotor speed must vary with varying wind speed. 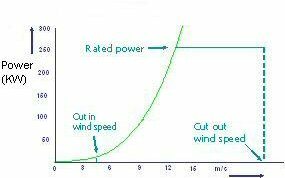 Doubling the wind speed should go together with doubling the rotational speed.This is shown by the green line, where indeed power goes with the cube of the wind speed. Then the rotor operates at a constant ratio of wind speed and rotational speed: a constant tip speed ratio λ. When operating at constant λ there is a 1 to 1 relation between wind speed and rotor speed. 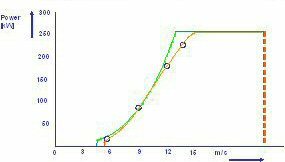 Hence we can transform the P - Ω curve into a P - V curve. At rated power, when the mechanical power equals the rated power of the generator, power control is needed to avoid excess power entering the generator. This is achieved by pitching the blades, and this kind of (aerodynamic) control is called "pitch control". At high wind speeds (typically 25 m/s) the rotor is stopped, in order to prevent excess loads on blades and tower. This wind speed is called the cut-out wind speed. For a fixed rotational speed the story differs. In that case there is only one wind speed at which the ratio between wind speed and rotational speed is optimal. In the example shown this wind speed is 9 m/s at the chosen rotational speed of 30 rpm. At lower wind speeds the rotational speed is too high for optimal performance, and at higher wind speeds, the rotational speed is too low. So both situations result into a sub-optimal working point. A big advantage is that at the higher wind speeds the increase in power with increasing wind speed is very limited. The brown dots, showing the achieved power for the different wind speeds, show hardly any increase in mechanical rotor power when going from 12 to 15 m/s. In these situations the angle of attack of the blades is so high that airfoil stall occurs along a large part of the blade. Hence this is referred to as stall control. The power control for higher wind speeds is achieved “automatically” by keeping the rotor speed constant. Thus, a stall controlled wind turbine is a wind turbine running at a fixed speed, independent of the wind speed. At the lower wind speeds the rotor is operating with airfoils that operate decently in an attached flow configuration. Since the rotor speed is kept constant the angle of attack of the airfoils increases with increasing wind speeds and thus they enter the stalled mode. By this stall the mechanical power of the main shaft is leveled off.